The Boss Kut is easy to use, has accurate cutting, and cuts 3" wide and up to 12" long dies! The system is a one press cutting system. It is quick and simple to use. Boss Kut will cut card stock, adhesive back vellums, metal papers, cork, foam, felt, some fabrics. 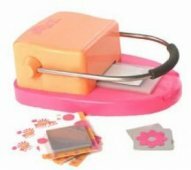 We are very excited about offering you all our wonderful dies at INCREDIBLE prices. All of Boss Kut's dies are wafer-thin dies, very similar to a Quickutz die. Boss Kut dies start at $3.99 for shapes and $49.99 for a complete alphabet set.